I know many people think that freelancers are out having lunch or working at cafes and travelling the world only working when we want to, but that’s not really the case. Creating a successful freelance business is all about routine and self-care. Freelancers who have no ties and can island hop whenever they feel like are few and far between. I know many freelancers jumped into this life to be able to spend more time with their families and children. That’s all well and good but having a dedicated space to your business is fundamental to your productivity, sanity, health and well-being. I’m going to break down planning a home office and what you should think about when you’re setting yours up. Like any good real estate agent, you’ll know that the most important thing is “location, location, location”. Do you want your office next to the back door where people are always going in and out, taking off their shoes and messing around? Or would you prefer to have it off to one side of the house away from most of the activity going on? I need peace and quiet to concentrate and to keep interruptions to a minimum. As a freelance translator, reading in one language and typing in another takes all of my brain power. I can’t even concentrate when I listen to music or hear the radio in the background. 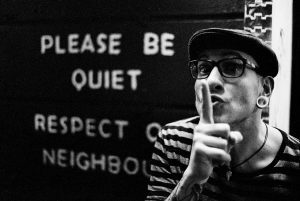 I’m just not one of those people who can tune out noises. That being said, make sure you find a spot that your family won’t accidentally interrupt you and you won’t have to worry about people messing with your flow. There have been studies, like this one by peoplehr.com, you can save up to 3 hours by removing unimportant interruptions. This was obviously done in an office work environment, but that doesn’t mean freelancers and those of us who work from home have a distraction-free environment. Cut out as many unnecessary interactions as possible to continue in a good head space and flow. So now that you’ve found the perfect room in your house (or maybe in the garage), let’s get started with planning a home office. First off, you’re going to need some natural light. Staring at a blank wall does nothing for your psyche. 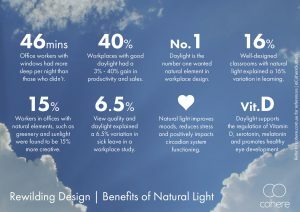 Studies are overwhelmingly positive about the benefits of having natural light. I touched on them in my article: 10 Ways to Manage Stress Levels. In summary, by having more light, you will sleep better, have increased productivity, more creativity, reduced stress and a host of other benefits that natural light can bring you. It’s easy to see why natural light is the No. 1 wanted natural element in workplace design. Our bodies are used to running off of light, and we base our body rhythms around our contact with sunlight. If you’re interested in the benefits of natural vs artificial light, you can check out my article: Blue Light and Sleep – What’s really happening. I’m guessing you’ve all heard a version of the old saying that goes ” you spend 1/3 of your life sleeping, so splurge on your bed.” As freelancers who work 8 hours per day, do we also not spend 1/3 of our lives in our chairs? When you’re in bed you’re not doing anything, why would you spend less on a chair where you’re actually being productive and making a living? 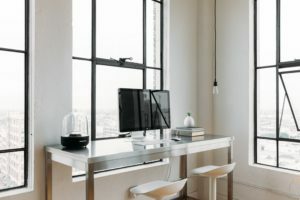 Even if you’re like me and you bought yourself an adjustable height desk (look here if you’re interested: Height Adjustable Standing Desk – What to look for when you buy) then you’ll spend about 4 hours per day in your chair. That’s still a large chunk of your life in your chair. Buying any ol’ chair at Target isn’t going to cut it. An ergonomic chair that can be adjusted to your body is something all freelancers need to have, no matter your profession. If you’re uncomfortable at work then both your productivity and mood will be in the gutter. Herman Miller is one of the best names out there, and they can run you upward of $1,000, but don’t let that scare you away. Let’s break it down. The Herman Miller Warranty is our promise to you that we stand behind the quality of our products. It recognizes your need for products that can stand up to continuous use. Many of our products are covered by a 12-year warranty that includes parts and labor. And when warranty work is performed in the U.S. and Canada, it covers the cost of service. You won’t get that type of warranty by buying from a big box store. 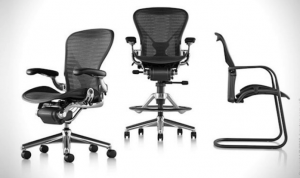 So, if you have your chair for 12 years, which you can easily do with a Herman Miller, then you would have spent less than $85 per year on your chair. There are about 250 working days per year, so that comes out to a grand total of less than $3 per day. That’s less than your caramel macchiato at Starbucks. I understand shelling out $1,000 at one time hurts but can you really afford not to? If Tiger Woods didn’t use the best golf clubs, do you think he would have been as successful as he was? Would you rather use the best image editing program or one that’s just ok? When you go shopping for a new computer, do you look for one that’s cheap or the best option for you in the long-term? I’m in this business for the long haul, and your chair shouldn’t just be something you sit on but rather aid you in performing at your best every single day. Alright, now that I finished my rant on office chairs, let’s get back to planning a home office. The best thing about planning a home office is that you can customize it as much as you want. If you want modern and clean, go for it. Rustic and classic, perfect. Ikea chic, why not? It’s yours, make it how you want. However, if you’re still stuck on getting started, I came across a straightforward diagram that should help you out. It’s all based on what activities you’re going to do in your office and the equipment and furniture you’ll need to get it done. Once you have a list of everything you’ll need, it’s much easier to create a layout. Those are my basic necessities. You, on the other hand, might need a landline, a filing cabinet for paperwork, drawers where you can store office supplies, a printer, outlets to charge equipment, USB plugs and a lot more based on your profession. Write out a comprehensive list so you can easily visualize exactly what it is you need. Then you can start to design where you’d like to put everything. 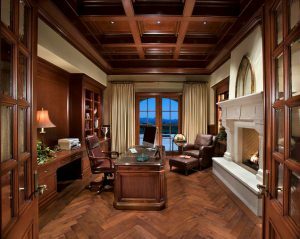 Your office is a place where you’ll spend hours and hours of your life, so it should look good. You should also feel good while you’re there because, in the end, you also need to be productive, or you might not be able to afford that $3 per day you spend on your chair. Functionality and ease of use should be top concerns for planning a home office. Putting your storage cabinet on the other side of the room that you need to get in 4 times a day isn’t the best use of your time. Having beautiful lighting that leaves a glare on your screen because it can’t be adjusted should probably be avoided as well. Make sure you find the happy medium between function and form, but if you have to sacrifice one of them, make it form. I talk a lot about self-care on this site because as freelancers and small business owners I believe putting yourself first, so you’re in a position to help others is why we did this. Even if you became a freelancer for the money, you probably did it so you can provide your family with the best or to have the means to help others (at least that’s what I like to think). There are hundreds of small ideas that you can implement into your home office to improve your productivity, sense of calmness and self-care. Implementing one or two small changes could drastically increase your overall productivity and how you feel when you enter your space. Many people underestimate the impact of art in their office space. Image how you feel when you see a wall with a big splash of color vs a blank white wall. There’s no comparison. In one study by the International Association for Professional Art Advisors, found that 78% of workers agree that it helps business reduce stress, increase creativity (64% agree) and encourage the expression of opinion (77% agree). In this day and age when it’s becoming increasingly easier for anyone to freelance self-care might be your leg up on the competition. If you’re always in a positive and productive state of mind, you’ll increase your chances of landing that client. You’ll also lead a healthier life where you can actually enjoy the fruits of your labor outside of the office. Planning a home office with self-care elements is a great way to build a foundation for a successful freelance career. If you’re curious about your self-care, please check out my Self-Care Assessment for a free download. In most offices, you generally see a few chairs for visitors to sit in and talk to the boss or Bigwigs. But, as a freelancer, do you really need extra seating? Maybe I’m slightly antisocial, but I’d rather not have guests in my office while I’m trying to work. Having a couple of plush Chester chairs, a decanter of whiskey and few empty glasses is just asking for people to come in and bother you. As I mentioned before, try to eliminate all distractions because this is your place of business. It should be treated exactly the same as if you went to an office to work. In the end, though, it’s all up to you. Creating a list of what you actually NEED to be successful is a great way to get started planning a home office. A simple sketch to help visualize could go a long way as well. Over the years you’ll find more things to help complement the basics. For more info get your free report on the top 5 Ergonomic products of 2018. Get your Free Report of the Top 5 Ergonomic Products Now! What are your thoughts on planning a home office? 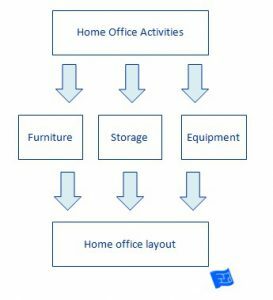 I like your idea of organizing a home office, it shows you have put much thought into the various details such as position in relation to disturbances. What really impressed me is your attention to the need for quality office furniture, such as an ergonomic chair. A chair such as that certainly is expensive but, as you pointed out, a freelancer spends at least 8 hours a day in their office, and seating is a priority. I don’t know about those plush chester chairs. I would have to hide them in the event of an ‘occasional’ visitor. What’s more attractive than ending a week by popping into the local freelancer’s office for a Friday night wind down! Thanks for stopping by! Picking a prime spot for your office can make or break your daily routine. I’d choose quality over quantity anytime, especially if I’m going to be using it for 8 hours a day. As you know better than most, it takes some time to get the right set up, but it sounds like you’ve found the sweet spot! 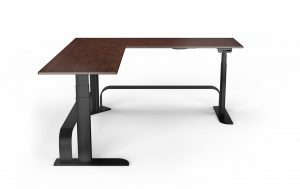 Did you get yourself an electric height adjustable desk or a workstation that you put on top of your desk? I’ve got the Flexispot height adjustable desk and would never look back! If you’re looking for Father’s Day gifts I have the perfect article: 10 Gifts for People Who Work from Home – Calling all Freelancers! I hope it helps! Thank you for stopping by and good luck! I think that you need a private office where you do not get a lot of disturbance as it is your job and you have got to be able to concentrate. I also have a hard time focusing when there is a lot of noise. I Agree with you that you should put money into getting a worthwhile chair, one that will be comfortable and will not hurt your back, but I didn’t know office chairs could be $1000.